Keeping your golf cart's batteries in tip-top shape is one of your primary maintenance responsibilities. This includes filling them with distilled water regularly, charging AND using them regularly, and keeping the cables tight. Read below for battery services we offer our customers. 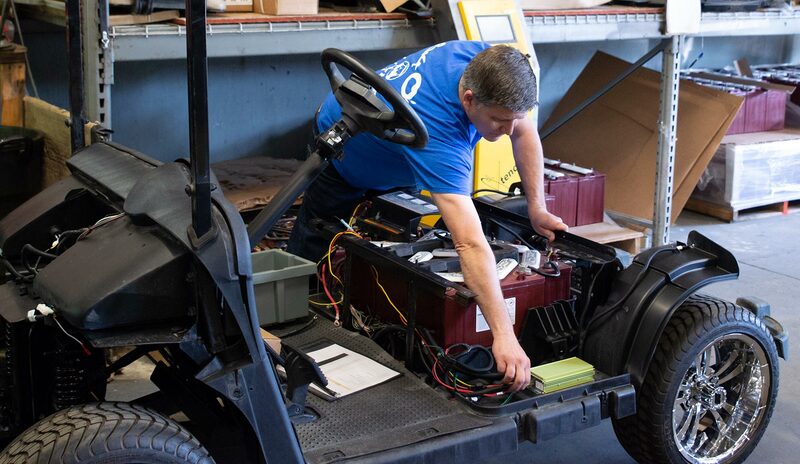 Why needed: To determine why your golf cart batteries are running improperly. Goal: Diagnostic results will provide information on your current battery's life. This information helps to identify if one or more batteries is causing your golf cart to run poorly. What the service includes: Our technicians will complete a full test on your set of batteries. This includes hydrometer readings on the battery cells. They also complete a discharge test to compare to the manufacturer’s suggested run times. Goal: To properly install new batteries. This includes tightening them per the service manual recommendations. What the service includes: Our technicians will remove the current batteries. We also clean and neutralize any spilled battery acid inside the battery compartment. Then we install a new set of deep-cycle Trojan Batteries.